When my husband and I had children, our world was opened up to new television shows, movies, books and toys. Despite being involved in youth ministries throughout my life, I wasn’t familiar with Adventures in Odyssey. In fact, I never heard about Adventures in Odyssey. The old saying goes, “It’s better late than never;” however, my only regret about this wonderful company is that it took me so long to realize their existence. In my opinion, I believe all Christian parents need to have in these resources in their library. You all may have read my post that I did HERE ,HERE and HERE about being careful what we read, watch, and listen to. It is important that we guide our children in making good choices, especially in the entertainment choices. We have several different Adventures in Odyssey resources at our house – books, CD’s, and DVD’s. I have never found anything I didn’t like about them! The stories that are told on these resources help children relate the story to the Bible and vice versa. The stories help to draw children closer to the Word of God. Adventures in Odyssey has been around for over 20 years! It is a Family Radio Drama which you can listen to HERE each week. They also have CD’s of the drama for home use! I will be sharing some of them later in this post, but you can see a list HERE. They are a wonderful tool to have on long car rides. 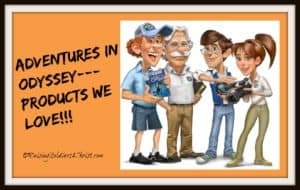 We have travelled across country a few times due to the military and we always take our Adventures in Odyssey CD’s when we do! My children also enjoy listening to the CD’s as a bedtime routine occasionally. We play the CD in their room as they are falling asleep. Not only are they hearing a wonderful story, they are learning about God as they drift off to sleep! If you want to read more about Adventures in Odyssey then click HERE. I also found a wonderful resource when I was preparing for this review! For those who are Odyssey lovers like we are, there is a website called OdysseyScoop!!! Check it out! It has listings of shows according to years going all the way back to 1987! A new CD will become available in October! You can pre-order it NOW at the link below!!! As an added bonus, if you pre-order it now, you will save $8.13 off the list price!!! Adventures in Odyssey also has books!!! I can honestly tell you that we have read all the ones that I will be listing. My kids and I just adore these books! Imagination Station- Join cousins Patrick and Beth as they travel to various lands and time in this 14 volume Imagination Station book set. Voyage with the Vikings #1 – Mr. Whittaker sends cousins Patrick and Beth to Greenland circa 1000. Attack at the Arena #2 – A mysterious letter leads the cousins to fifth-century Rome. Peril in the Palace #3 – The Imagination Station adventures continue as cousins Patrick and Beth are kidnapped by Mongol warriors. Revenge of the Red Knight #4 – Patrick and Beth find themselves as guests in a beautiful castle in 15th-century England. Showdown with the Shepherd #5 – Cousins Patrick and Beth go to the Holy Land in the tenth century BC. Problems in Plymouth #6 – Patrick and Beth’s next adventure leads them to Plymouth Plantation in 1621. Secret of the Prince’s Tomb #7 – The cousins land in Egypt, where they befriend two children who are second cousins: a boy named Gilead and a girl named Sherah. Battle for Cannibal Island #8 – It’s 1852 and cousins Patrick and Beth sail to Fiji on the HMS Calliope. Escape to the Hiding Place #9 – Patrick and Beth arrive in World War II Holland in the farm country. Challenge on the Hill of Fire #10 – Kidnapped by Celtic Druids in 433, Patrick and Beth are headed to certain death when followers of a former Irish Slave save them. Hunt for the Devil’s Dragon #11 – If you’re brave, follow cousins Beth and Patrick to Libya in the 13th century. Danger on a Silent Night #12 – Join cousins Patrick and Beth as they travel in the Imagination Station to see the first Christmas. The Redcoats are Coming #13 – Patrick and Beth as they assist the revolutionaries by waking up the sleeping citizens of 1775 Concord. Captured on the High Seas #14 – Join Patrick and Beth in a seafaring adventure set in 1781. Book 15 is available for pre-order, too!!! Surefire recipes to nourish your children’s faith. You make sure your children get the proper food they need to grow physically. But are you providing a healthy spiritual diet to grow their hearts for God and others? Now you can give them both with these family devotions for mealtime dished up by John Avery Whittaker, Adventures in Odyssey’s friendly mentor. These devotions can be gobbled up at any meal in any place. Start your children’s day with a bowl of cereal and a story that teaches biblical truth. Or keep a copy of Whit’s End Mealtime Devotions in your car to use during picnics or fast-food stops. At holidays, use one of the special-occasion devotions or create your own memorable meals by using one of the fun theme devotions. Whenever your family gathers for a meal, look to Whit’s End Mealtime Devotions to help nurture a thriving faith in your children. Many families are on the go so much that it’s hard to get everyone around the dinner table long enough to share a meal, let alone hold a meaningful conversation. Parents looking for help with conversation starters and ways to build strong relationships with their children will want to incorporate this devotional into their family’s routine. Join Whit, Connie, Eugene, Wooton, and your other friends from the exciting world of Odyssey and DISCOVER tried-and-true biblical truths— like salvation, prayer, and forgiveness, and many others—that form the core values of Christianity. Wandering with Wooton—Musings from the wacky postman on all things licorice and godly. Kids learn to apply God’s Word to their everyday lives — through prayer, Bible facts, stories and Scripture using the NKJV text. The Adventures in Odyssey characters make each devotion fun and applicable to a child’s life. A perfect companion to the Adventures in Odyssey Bible. Mark Prescott’s not your typical 10-year-old kid. He has a best friend whose a girl, a mind that has to have answers, and a need to have things the way they used to be. Before it’s all over, he learns priceless lessons about friendship, living with change, and the gift of forgiveness. Fans of the long-running audio series Adventures in Odyssey can hardly remember a time when there wasn’t a Connie or a Eugene—or an Imagination Station. But there was. Now step back in time as these exciting novels whisk you away to the days before the popular radio show. Author Paul McCusker has written over 200 episodes of Adventures in Odyssey and been involved from the early days of the show. Set in a time before the radio show, these stories often reference the beginnings of inventions like the Imagination Station, familiar characters like the Barclays coming to town, and other AIO references that fans will enjoy. Mark learns a new perspective about the people around him in Lights out at Camp What-a-Nut. The King’s Quest is an Imagination Station adventure where Mark experiences how God is at work in our world. Jack Davis gets tangled up in a dangerous web of intrigue in Danger Lies Ahead. Patti’s future becomes a difficult lesson in truth and consequences in A Carnival of Secrets. For the ULTIMATE Adventures in Odyssey Fan check out the 25th Anniversary guide! For more than 20 years, Adventures in Odyssey has delighted kids (and kids at heart!) with exciting stories and character-building truths. Now you can be part of the real adventure with this updated, behind-the scenes guide to people, places, and faces of the world’s #1 family audio drama. Get backstage details on the making of your favorite episodes, books, and videos; hundreds of photos, including an eight-page color photo gallery, and trivia for over 700 episodes, as well as step-by-step instructions on how to draw the characters. It’s an exclusive guide that no fan can do without! Did I mention that Adventures in Odyssey had DVDs too? Well check out this amazing link!!! It has been an honor to be a part of the Adventures in Odyssey Club promotion team. I hope you enjoyed this list and it helps you find more faith-based entertainment for your kids! Awesome review! I have never heard of this series. It sounds like a wonderful series to minister to the hearts of children. We LOVE Adventures in Odyssey around our house. Honestly, I may love them even more than my kids! I just appreciate the way they reinforce again and again the things my husband and I are trying to teach our children. And I could never count the times episodes have really ministered to me personally as well. But we’re new to the book series! I’ve actually just ordered my first Adventures in Odyssey books from the Imagination Station series and I’m excited to use them in our homeschool. Thanks so much for sharing more about AIO!